Gen13 can be said to owe its popularity to a combination of beautiful "bods," smart-aleck attitude, and genuine enthusiasm and fun. 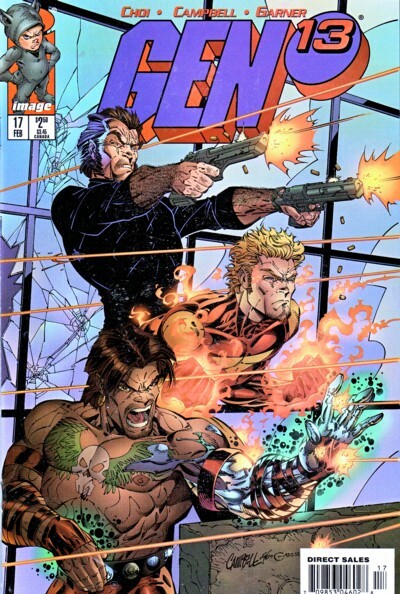 Spurred on by the wild success of the Gen13 mini-series, the five, super-powered twenty-somethings began this ongoing title in March, 1995. To celebrate, Image kicked off issue #1 with an unprecedented thirteen variant covers (plus another that appeared as part of a collection). The team consists of Burnout, a terse young man who has the ability to fire plasma blasts; Freefall, an independent woman who can control the forces of gravity; Rainmaker, a new addition to the team who controls the forces of nature; Grunge, the team’s "class clown," who also has the ability to alter his genetic structure at will; and leader Fairchild, the gorgeous, smart, and super-strong leader of the team. They also get adult supervision of sorts in the form of John Lynch, their mentor. - ComicBase™ 7.0.